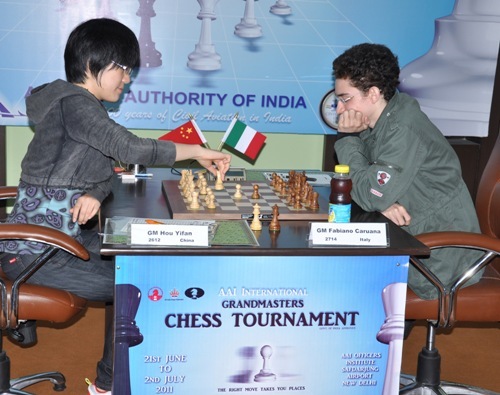 Top seeded Fabiano Caruana of Italy maintained his winning streak with a third successive win, this one over women’s World champion, Hou Yifan of China, while Parimarjan Negi drew with Filipino Wesley So. Sasi, who had lost his first two games, played white in a Catalan Opening and for most of the game held an advantage. But Viktor Laznicka put up a spirited defense and hung in there for a long time. Laznicka was passive, but once he opened the position, he seemed to be creating weaknesses. Into the third time control, the Czech finally resigned and gave the Indian a well-deserved win. 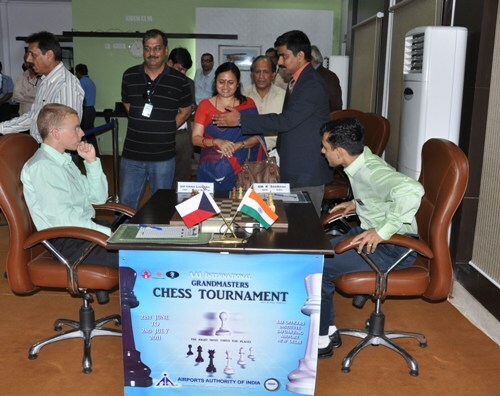 Mrs. Rashmi Singh, Mission Director, Mission Convergence, Govt of India watches the start of the third game between Krishnan Sasikiran of India and Viktor Laznicka of the Czech Republic in the AAI Grandmasters Chess Tournament on Friday. “Laznicka was probably slightly worse from the beginning, but maybe he could have defended. Once he created that weakness f6 on the 24th, I knew I had a big advantage. All his pawns were weak and his kingside was also somewhat weaker. It was then a matter of staying in and completing the job,” added Sasi, who plays Hou Yifan. Caruana win his win has a perfect three out of three with seven rounds to go in the Category 17 tournament, the highest-ever in India. Despite his loss on Friday Laznicka with two points is second. Laznicka has two points. Negi and So have 1.5 points with a win and a draw each. Sasi has one point and Hou Yifan none. Hou Yifan of China plays with Fabiano Caruana of Italy in a third round game at the AAI Grandmasters Chess Tournament on Friday. Caruana won his third successive game of the tournament. The shy and soft-spoken Caruana was pleased with his win and said he was beginning to feel comfortable. “It is a new country and I always worry before a tournament and it is a strong tournament,” said a smiling Caruana, the World Junior No. 1. “But with three wins, it has been a great start.” He won comfortably in 37 moves. So and Negi, who have had three draws before, played out a fourth one on Friday in a Sicilian. Parimarjan Negi said, “It was a very normal game. It did look at time black (Negi) was better, but there was no clear advantage for me. We decided to draw after 30 moves when there was nothing in it.” It was the first draw in three days. 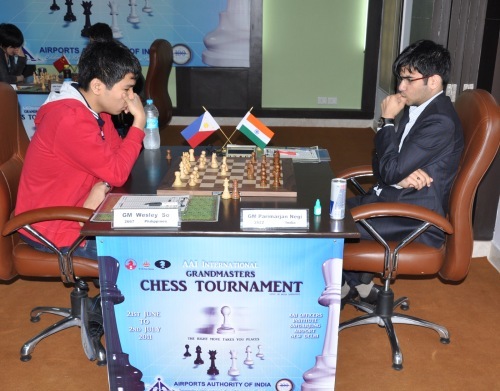 Wesley So of the Philippines plays Parimarjan Negi of India in a third round game at the AAI Grandmasters Chess Tournament on Friday. So and Negi drew the game. The games in the third round were inaugurated by Mrs. Rashmi Singh, Mission Director, Mission Convergence, Govt of India. 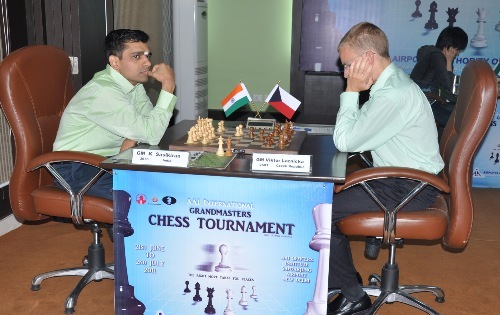 Krishnan Sasikiran of India plays Viktor Laznicka of the Czech Republic in a third round game at the AAI Grandmasters Chess Tournament on Friday. Sasikiran won his first game of the tournament.